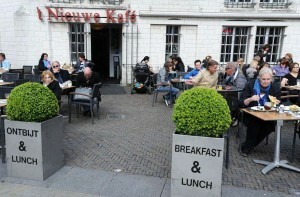 ‘t Nieuwe Kafé serves breakfast, lunch, drinks, snacks and pastries. It is accessible from the church as well as from Dam Square. The Museum shop of De Nieuwe Kerk offers an entirely new collection with every exhibition. You can find a wide range of literature and products concerning the current exhibition. The shop is accessible through the main entrance of the Nieuwe Kerk as well as through the street entrance (left of the main entrance of the Nieuwe Kerk). We warmly invite to visit our shop. Admission hours: Monday through Sunday 10 am – 5 pm.